Email is used for both personal and business communication and is generally much more informal than letters and memos. There are however a few basic rules/guideline that you should be aware of. 1. Always have a clear subject never send an email without a subject line. 4. Keep emails brief and to the point. 4. If you are sending attachments make sure you attach them before sending. 6. Don’t use Return receipt on all email. Only use it when absolutely necessary, and remember it isn’t foolproof. It is better to ask for a reply in the email. 7. Remember email isn’t really private, it can be forwarded and read by people other than the intended recipient. Therefore don’ send confidential information in emails unless you encrypt them. See email encryption. 8. Remember email in corporate networks is monitored, and you should be very wary of what you send. 9. Only send it to people who really need to receive it. 10. Check spelling and content before you hit send. 2. Let people now that their email has been received if they are expecting a response. 4. 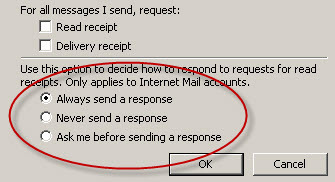 Do not use the reply to all option unless you really need all recipients get the email. 5. 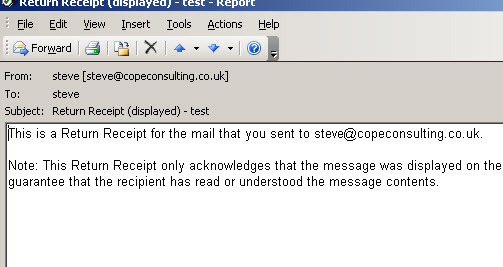 Never use the reply to all option if the email was sent to a large list. 1. Generally don’t forward emails. If the person wanted to send it to that person they would have. 2. If you do forward email then you should include your own comment as to why you have forwarded it. 3. Remember attachments are also forwarded unless you remove them before sending. If you need to know if someone has received your email then using email read receipts would seem like the obvious solution, and in some respects they are.